The JDSU J6802B Distributed Network Analyzer MX is a rack-mountable protocol acquisition and analysis solution, with an embedded PC and integrated Network Analyzer software application. The DNA MX includes data acquisition hardware and accommodates line interface modules (LIMs). The Protocol Analysis Probe – DNA MX (J6802B) is a transportable and rack-mountable protocol acquisition and analysis solution. When deployed into the network under test, use DNA MXs to perform distributed measurements at different points in your network. 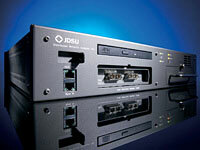 An embedded version of the J6840A Network Analyzer runs in the integrated PC of the J6802B. In addition, remote Network Analyzer software can access and control the DNA MX via Instrument Manager. Network Analyzer Software running on the embedded processor is used to control the internal acquisition system and any directly attached DNAs. The DNA MX is accessed and controlled from an external PC via a web browser (requiring no other software) or from an Instrument Manager. Included with each DNA MX is a choice of 10/100/1000 Mbps PC card or combo 56 kbps modem and 10/100 Mbps PC Card for telemetry purposes.